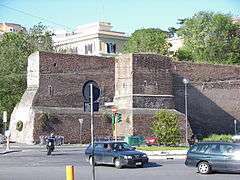 A section of Aurelian wall between the Porta Ardeatina and Porta San Sebastiano. 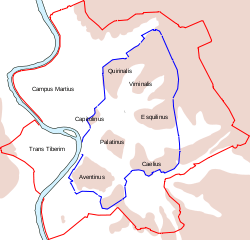 Map of ancient Rome with the Aurelian walls (red) and its gates highlighted. The 4th-Century BC Servian Walls (blue) are also shown. The walls enclosed all the seven hills of Rome plus the Campus Martius and, on the right bank of the Tiber, the Trastevere district. The river banks within the city limits appear to have been left unfortified, although they were fortified along the Campus Martius. The size of entire enclosed area is 1,400 hectares (3,500 acres). The full circuit ran for 19 kilometres (12 mi) surrounding an area of 13.7 square kilometres (5.3 sq mi). The walls were constructed in brick-faced concrete, 3.5 metres (11 ft) thick and 8 metres (26 ft) high, with a square tower every 100 Roman feet (29.6 metres (97 ft)). In the 4th century, remodelling doubled the height of the walls to 16 metres (52 ft). By 500 AD, the circuit possessed 383 towers, 7,020 crenellations, 18 main gates, 5 postern gates, 116 latrines, and 2,066 large external windows. Aurelian's construction of the walls as an emergency measure was a reaction to the barbarian invasion of 270; the historian Aurelius Victor states explicitly that the project aimed to alleviate the city's vulnerability. It may also have been intended to send a political signal as a statement that Aurelian trusted that the people of Rome would remain loyal, as well as serving as a public declaration of the emperor's firm hold on power. The construction of the walls was by far the largest building project that had taken place in Rome for many decades, and their construction was a concrete statement of the continued strength of Rome. The construction project was unusually left to the citizens themselves to complete as Aurelian could not afford to spare a single legionary for the project. The root of this unorthodox practice was due to the imminent barbarian threat coupled with the wavering strength of the military as a whole due to being subject to years of bloody civil war, famine and the Cyprian Plague.